Marshes, wet meadows, calcareous fens, bogs and shrub-carr. Varied. 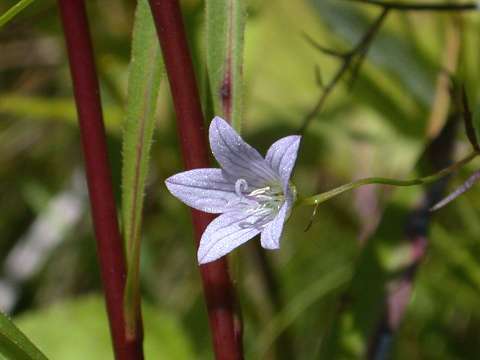 Often found growing amongst sedges. Nova Scotia and Quebec west to Saskatchewan, south to GA, KY, MO, and NE. Perennial from filiform rhizomes; stems thin, weak, often relying on other plants for support, somewhat 3-angled, harshly scabrous with stiffly hispid hairs. Stem leaves entire, less than 1cm wide, linear to narrowly lanceolate, often roughened along the edge and midvein below. Flowers pale blue or white, solitary on slender peduncles; sepals triangular to lanceolate, to 5 mm; corolla funnelform, 4-13 mm. Abundant flowers can give the appearance of baby's-breath. Two varieties are recognized.